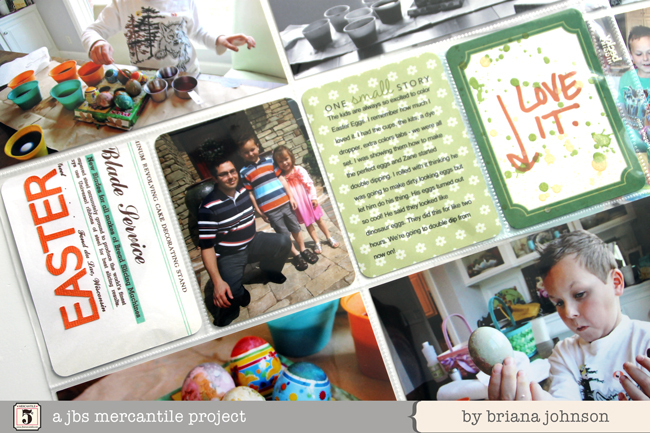 Today I'd love to share the Project Life spread I made using Modern Mercantile. 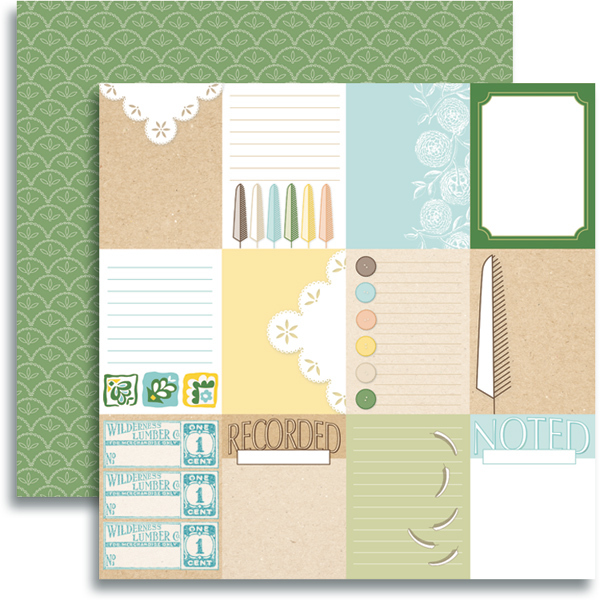 The card sheet, shown below, works perfectly for the divided 3x4 pockets for Project Life. 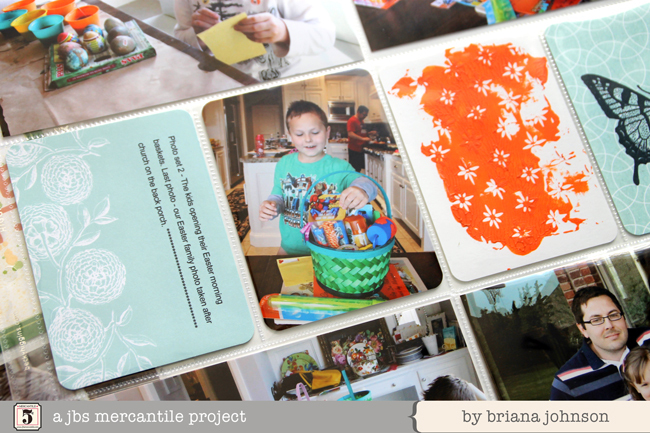 The stencil used here with orange paint was from the current Mercantile February Kit. The butterfly is JBS digital and can be found HERE. These colors work so well for spring and summer. 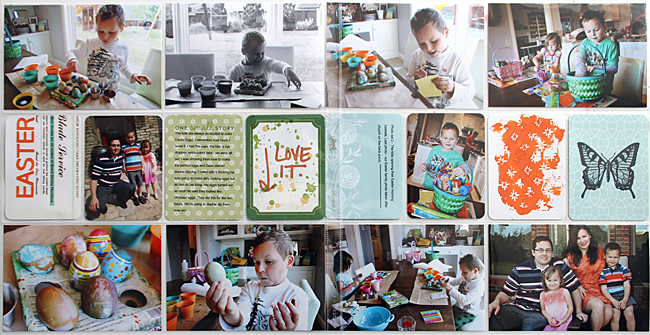 As you can see here they worked perfectly with my Easter pictures from last year. Aren't these fabulous? Lisa did a superb job designing this line! I can't get over how she was able to so perfectly marry vintage and modern. The sheet above, Hodge Podge, is what I used for several of my cards. Those doily cards are awesome! They all are! And I'm mad about the green scalloped eyelet lace on the back. You're definitely going to need two sheets of this one, minimum, so you can use both sides! I cut the aqua floral card out, rounded the corners, and ran it through my printer using easy release tape on a scratch piece of paper that I had already printed with the text - a scratch 4x6 cardstock piece makes it easier to get a better alignment estimate in my opinion than a full 8.5x11 sheet. The green floral card is also a pattern from Modern Mercantile - I simply cut it down to size and ran it through the printer again. I splattered mist on the green label card, let it dry, then ran that card through the printer as well to get the Ali Edwards digital brush stamp on there. Be on the lookout - Modern Mercantile is shipping to retailers right now! You are going to love this collection!